It’s funny that I’ve never read anything by Paul Cornell before. I really like the guy, I have listened to every episode of the SF Squeecast, I enjoyed his presentation of the Hugo Awards a few years ago, and I generally like what he has to say on the interwebs. So no pressure, Paul, but I had high hopes for this novella. And it passed with flying colors. 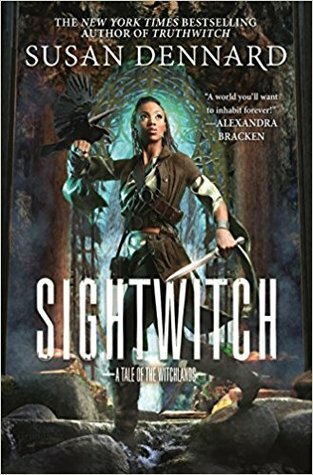 I was enchanted and creeped out and just completely enjoying this well-paced, well-written story about three witches. First sentence: Judith Mawson was seventy-one years old, and she knew what people said about her: that she was bitter about nothing in particular, angry all the time, that the old cow only ever listened when she wanted to. Judith Mawson stole my heart on the very first page. The grumpy old lady who is known as a bit of a strange one in her village knows things for what they are. Her banter with her husband, whenever she leaves the house, is charming and shocking at the same time, her view on life and her neighbors completely understandable. I adored Judith from the start and she helped me fall into the story without problems – a welcome change after the first Tor.com novella and I didn’t really hit it off. Autumn, owner of the local magic shop, is also a bit strange, at least in the eyes of the villagers, and in a town as small as Lychford, everyone has an opinion on everyone else. Cornell managed to convey this feeling of people being up in others’ business really well, without long dialogues or descriptions. It’s just a feeling, floating around in the air, on every page of the novella. Lizzie, Autumn’s old friend, has recently returned to Lychford and the relationship between the two women is fraught, to say the least. Lizzie takes on the job of reverend in Lychford, something Autumn (who is all about logic and science and doesn’t think much of religion) can’t fully understand. But Lizzie brings her own demons back with her – it is these layers, the fact that each of the three women has a back story, a past, and their own hopes and dreams for the future, that makes the novella so compelling. We learn early on what happened to Lizzie and why she is struggling with her faith. Autumn’s secret comes out only later, and Judith has a big reveal left for the very end. The plot itself was also solid. On the one hand, a big supermarket is supposed to be built in Lychford, destroying its idyllic life, but offering all sorts of employment to its inhabitants. So the village is divided. All will come down to a final vote. But that’s not all there is to it. If the supermarket is built, the barriers between our world and the fairy worlds will be broken and things will go batshit. Judith knows this. Now she needs to convince Autumn and Lizzie of this fact and get them to help her. Witches of Lychford is a charming, enchanting story about a small village, about three women having to work together without having much in common anymore, other than their connection to the Other World. The way they come together, the way the lurking evil is introduced, it was all so wonderfully done I can’t find the right words for it. The pacing was spot on, the characterisation beautiful, and Cornell even managed to break his readers’ heart right there at the end. To pack so much depth into a small novella is nothing short of amazing. I am so excited that he will revisit the town of Lychford (just found out about this a few days ago) and that I may get to see Judith, Lizzie, and Autumn again. Either way, Paul Cornell is now very high on my to-buy list. The man isn’t just charming on podcasts, he is also a damn fine writer! It seems like all of these Tor.com novellas have been a hit. I’ve only read Sunset Mantle, so far, but I liked it a lot, and just got a copy of Envy of Angles in today (and it came with a mini print of Witches of Lychford’s cover too!). I’ve haven’t read any of Paul Cornell’s work, but I do own a copy of London Falling. I heard it was pretty creepy and scary. I have read three of them so far and Sorcerer of the Wildeeps was the only one I didn’t like. Binti and Witches of Lychford were both amazing. Can’t wait for Sunset Mantle… that kind of slipped through my radar. Well good to know! I haven’t read anything by Paul Cornell either, despite having loved his work on Doctor Who, and it’s far past time I changed that. This sounds deeeelightful. May I ask what the tor.com novellas are? I have never heard of it.